Experience the convenience of staying in a fully self contained one bedroom apartment with a full kitchen and views onto snow gums. This cosy apartment has stone kitchen benches, polished floor boards and modern appliances and is great for families, groups of friends or couples. 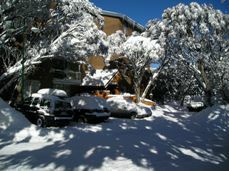 Located in the Mt Buller Village, the apartment is 100 metres from shops and restaurants. Located on Stirling Track only 80 metres from the top of Chamois double chair. Free intra village bus stops near the front door to Snowflake Complex.